I love this skirt, in theory. 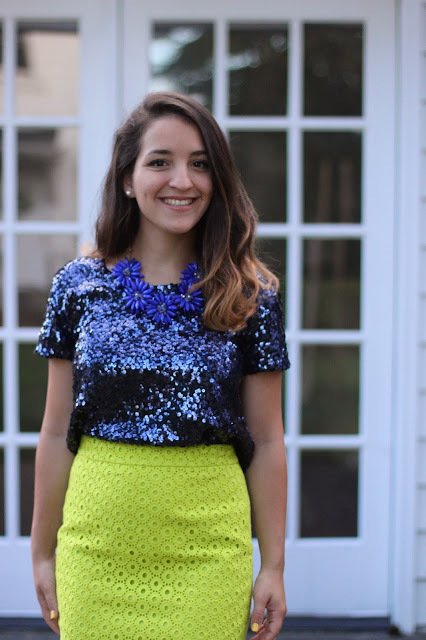 It's neon and has a great texture, but it's Jcrew. You should get what I mean from that simple statement. What is with them and their non-penciled pencil skirts?! Mind you, this particular one WAS ALTERED TO BE PENCILED and it's still not right, not because of the seamstress who did it, but because of the simple, boxy nature of Jcrew skirts. Not all of us are shapeless white girls like the rest of your customers! Rant over, it's not that bad, even though I think it makes me look fat. Ha! I was channeling a peacock for this look. You know, the colors. Whatever. Also, glitter in the day (well, northwest evening, which is basically day). My sister and I made a pact. It basically goes something like this: who gives a crap about what people think or how blinded they might be from the sun's reflection, we are glittering it in the freaking day! For no apparent reason, most of the time. Grocery store? Yup, I think I'll wear my glitter tee. Saying "tee" makes it cas., do you hate me for saying "cas."? I do too. Just out of curiosity, did you buy the skirt in regular or petite? I hate how most if not all J. Crew stores don't have a petite department. I bought a pair of Minnie pants in regular and they were so boxy at the knees and the waist was an inch and a half too big. I ended up giving them to someone else because I just wasn't in the mood to take on such a large project. I really like Ann Taylor for pencil skirts especially in the spring/summer. ugh, you literally have the nicest style. I'm jealous that you can pull off basically anything! Why thank you! That's one of the nicest things I've heard today. Made my evening. loving the punchy look here! that top is fabulous, paired with a fun skirt! love it.